The quality of the aluminum alloy is guaranteed to be surface oxidized. Suitable for most mobile phones on the market, using widths from 2.3'' to 3.9''. 360° horizontal rotation design, 12-speed angle adjustment, fixed lock. Diameter:fit for about Φ24mm - 38mm(used attached spacer) handlebar used. OXIDATION PROCESS LEVEL TREATMENT - 100% Aluminum Alloy bike phone mount, this heavy duty handlebar phone mount will hold your device firm and stable, designed for powersports, secure your phone in the wildest of adventures. 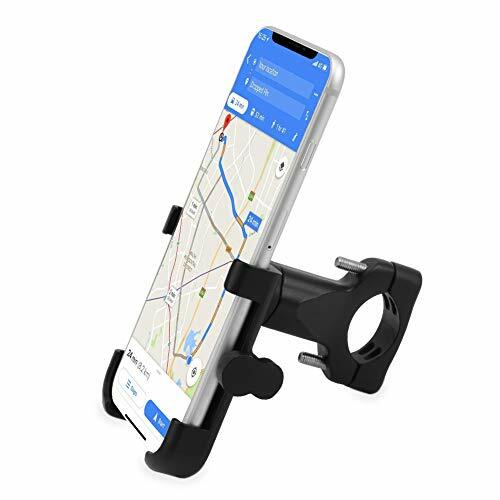 FITS MOST PHONES & HANDLE BARS - Pipe clamp holder for handlebars with a diameter of 0.9'' to 1.5'', will securely fit any cell phone width from 2.3'' to 3.9'' including the new iPhone X 8 & 8 Plus & Samsung Galaxy. MULTIPLE PROTECTIONS TO YOUR PHONE : Cushioning adhesive patch for clamp can reduce vibration as well as avoid phone surface scratches. The tension knob on the swivel mount tighten down very well, so the orientation don't travel around, you will never worry the bumpy ride would knock your phone out of phone mount bike. EASY TO INSTALL AND RELEASE : This Phone holder with Complete mini tool for install, not need other tool by yourself, only need to locate and lock nut. It can be installed on bike handlebar without blocking your smart phone's button. Swivel hoist ring to easy put on or take off your cell phone.